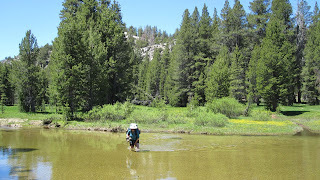 We are just back from a great trip into the West Walker River—which became part of the Hoover Wilderness this year. In fact, the signs are brand new at the entrance! We’ve been a bit frustrated by the snow levels this year, and so we headed east, to where they get less snow to begin with. 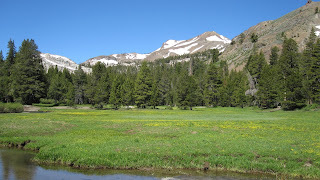 Leavitt Meadows on the east side of Sonora Pass is a convenient trailhead to get into the West Walker River, an area we’d heard about but never explored. First day was a very comfortable stroll 7 miles up the West Walker River, punctuated by some nice lakes ( Roosevelt and Lane--that's Roosevelt in the photo at right) and great views of Tower Peak and the West Walker River. Then we came to the ford. Our trail to Fremont Lake was supposed to cross the river, but it was flowing high and fast. Happily, a pack train driver suggested we use the hikers' ford a bit further up the river…and we did that. Icy water, moving quickly, up to our crotches! What a wake up! Man, the next mile up to Fremont Lake was a climb, but the combination of adrenalin and hyper-cooled legs made it a lot easier! Fremont Lake was gorgeous…that's it in the photo below. left. And I caught a couple of nice 12” rainbows there. But the skeeters were fierce. This is only the second time in our lives that we’ve used the headnets during dinner---lifting them up for each bite of food. 8.5 on a 10 point scale…And that was despite a breeze that gave us a respite from time to time. Because this was early in the year, we didn't see many other people--but we did meet a pack train that was leaving as we were on our way in. Which was convenient. An evening hike up the ridge also led to some great views...and fewer mosquitoes for a while. The next day was up to Cinko Lake, and we got on the trail early—if only to avoid spending more time with our biting friends. We managed to take the trail to Walker Meadows (not exactly intentionally, but it seemed like a nice enough detour). Only once there, we discovered another icy ford (only mid-thigh!) and about a mile of trail under water and basically disappeared underneath the meadow and mud. 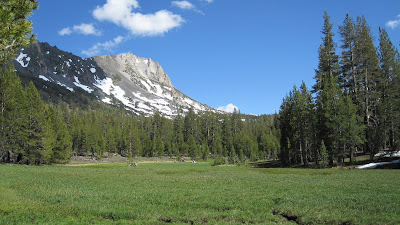 Thank goodness for our water shoes…but the views in the meadow were well worth the detour. Walker Meadows photo t right. The trail from there headed up the Walker River…and we just decided to cross country to the PCT, which we met right at the bridge across the river. Easy navigating, not so easy walking. And then when we followed the trail up to Emigrant Pass, we did the same thing. The trail was under snow once it crossed the river, so we stayed on the south side and kept climbing until I decided we must be near the junction. And sure enough, the trail to Cinko Lake appeared right under our feet. It was an easy, if wet, walk up to the lake….and that was stunning. Sunny forest on the south side, forbidding snow to the west. We spent a lovely night there, caught about ten nice 8-11” brookies, and saw about three mosquitoes all night. Paradise. And we were the first people here this year. That's it at left...in the afternoon. If you click on the photo, it should take you to the rest of the shots from this hike...which include some amazing reflections of Cinko lake the next morning. Truly a wonderful spot to have all to ourselves for a night. The following day we hiked out towards the PCT to the south of the Lake, then tried to get to Lake Harriet—but decided that it wasn’t worth the effort to ford the stream twice. 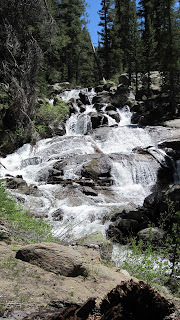 Instead we headed down Cascade Creek to the West Walker. a brutal trail that drops 700 feet in a mile. It was warm, and we were grateful we were going down! Down at the river, we still needed another ford to get on the south side…and so we hiked down river past the junction with the Long Lakes trail. We kept watching the river, but it never looked very welcoming. Just as we were about to give up and try to hike all the way back to the Fremont Lake Ford, a pack trail appeared that looked perfectly doable. It was—crotch high again, but very slow moving water. Piece of cake. 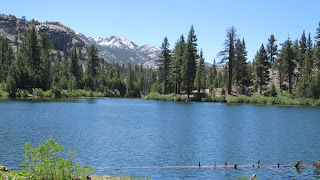 M was greatly relieved, as she really didn't enjoy the first ford to get to Fremont Lake. Once on the south side of the river, we thought we’d head up Long Canyon—and just keep going until we got high enough to avoid the skeeters. We were certainly the first people to go up this trail this year. What we didn’t know was that the first mile and a half of that trail goes straight up—and so did we. But with the occasional views of distant peaks keeping us entertained, and a couple of stunning waterfalls, (photo at left) the trail managed to encourage us to get up into the meadows at about 9,000 feet or so, about 2.5-3 miles into the canyon. Amazing site---with breathtaking views. 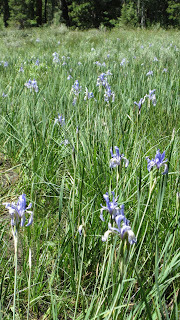 Yes, they were wet meadows. But they were also at 9,000 feet. The skeeters were bad during dinner, but the temperature dropped soon after, and they disappeared. And soon after, we dived into our bags. It was getting cold! Next morning we found a touch of ice in our water bottles, and no skeeters. We quickly packed up and started back down. As we dropped, the temps warmed and the skeeters came out to play. By the time we were back down to the West Walker, every stream crossing was a battleground—and we were armed with DEET. No fun. Lovely trail. 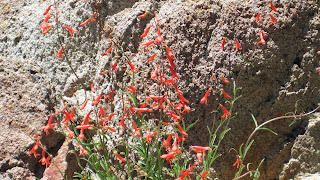 Flowers on every rock and in every patch of green. Lunched overlooking Roosevelt Lake, then decided to take the Secret Lake bypass. That added about a half-mile to our trip back to the car—and about 700 feet of elevation gain. And then 700 feet of elevation loss. From snowy meadows and freezing temps, this trail led us to almost desert like conditions, and real warmth. 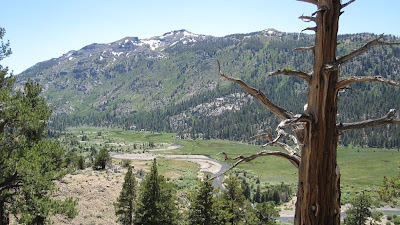 The final stretch had views over Leavitt Meadows and the West Walker River. 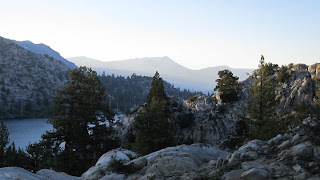 It was an amazing day of hiking from one biosphere of the Sierra to another. Finally got to the trailhead about 3:45—a long day that was full of adventures. A note about this area and the National Geographic Map of this section of the Sierra---there are lots of use trails that are not on the maps, and not every junction is marked either. There is no sign at the Secret Lake Junction with the trail to Poore Lake, for example. Twice we came to erroneous conclusions because of this, and we've been hiking and following maps for decades. Happily, we knew where we had to go, and just headed that direction when the trail seemed to disappear. And the strong colors of these maps also seem to obliterate the contour lines in many cases…which just adds to the sense of adventure!